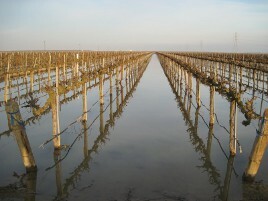 Long-term groundwater overdraft and five years of drought in the San Joaquin Valley (SJV) are threatening the reliability of drinking water for local communities and irrigation water for crop production. Additionally, the California Sustainable Groundwater Management Act requires newly forming Groundwater Sustainability Agencies (GSAs) to develop plans by 2020 to manage groundwater supplies to ensure long term sustainable yields and avoid undesirable results. There is growing interest, across many stakeholders, to move groundwater basins toward balance through acceleration of recharge when recharge water is available. However, there is a lack of easily accessible information about the optimal locations and methods to capture available flows for groundwater replenishment. This demonstration project will provide irrigation districts and GSAs with a decision support tool that will enable them to create and assess recharge scenarios for inclusion in their Groundwater Sustainability Plans. The tool will allow water managers to evaluate where (using fallow land, active cropland, and dedicated recharge basins) and when to optimally capture available flood flows at the lowest cost without creating unintended environmental and social impacts in their basins. Together, Sustainable Conservation and Earth Genome, the demonstration project team, envision making geospatial/temporal natural resource planning data more readily available to all natural resource and water managers in the SJV so that water management alternatives can be more easily identified, compared, and prioritized. This demonstration project is working in partnership with Madera Irrigation District and Tulare Irrigation District to create version 1 of the tool. We are building out GRAT v1 for release to our partner Irrigation Districts in April 2017. Once released, we aim to extend GRAT functionality to other areas and partners in 2017.